The last picture I could find of her all together. September, 1988. And now in February, 2011. Oh, that's not rust on the bumper; it's "patina." 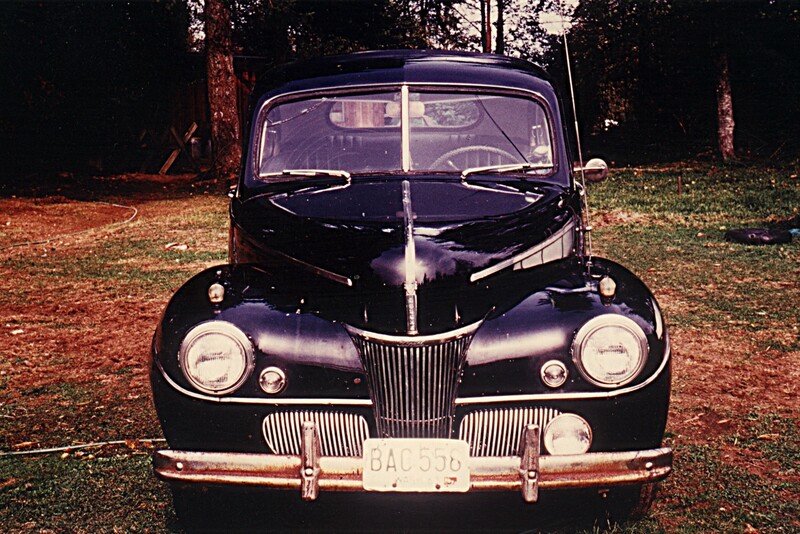 Emmy Lou is a 1941 Ford Super Deluxe Club Coupe. 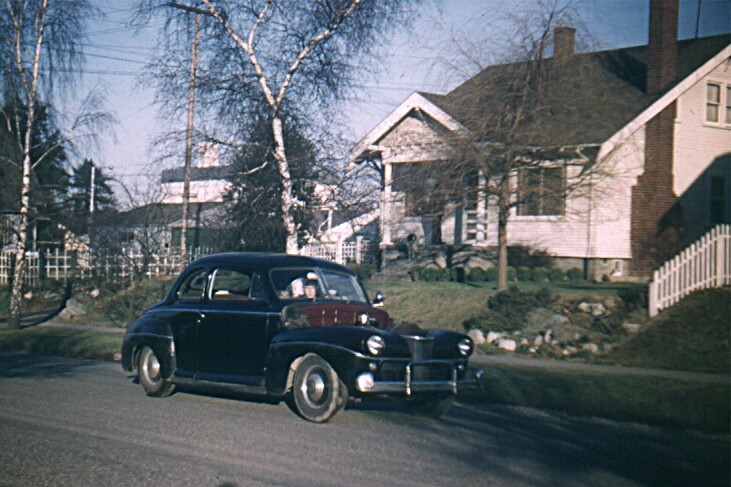 Officially, Ford called this model a "Sedan Coupe" because of the number of cubic feet of passenger space. The Title says "Club Coupe." She and I joined forces on August 10, 1956 when I bought her from Smiling Jack's Used Cars where I was working as lot boy and doing everything from washing cars to changing engines and putting bananas and sawdust in differentials. ( Yes it really worked. )( For a while.) I paid the grand sum of $125.00 for her which was the total amount of my summer wages. (I also paid the $56.00 for insurance; otherwise my parents wouldn't let me drive her.) I was 16 years old. She is named after a newspaper comic strip about a teenager and her hotrod boyfriend, Alvin. It ran from 1944 to 1979, was named "Bobby Sox," and was written by Marty Links. The first question that always comes up would be "is it a hot rod, custom, street rod or rat rod?" Don't call her a rat rod if you're anywhere within swinging, throwing or running over distance! I never thought of her as a hot rod because she wasn't stripped enough or fast enough. She had frenched headlights, leaded hood and leaded trunk lid and lowered 6" all the way around at the time so I guess "Custom" fit best. "Street rod" and "rat rod" hadn't been thought up yet. "Old school" hadn't been born yet. Remember, we're both Pre World War II models. There was just guys that worked on cars. I am one of them. The fenders and hood were later ripped off by a woman turning left in front of me. That was one of the four (4) times she's been seriously wrecked. 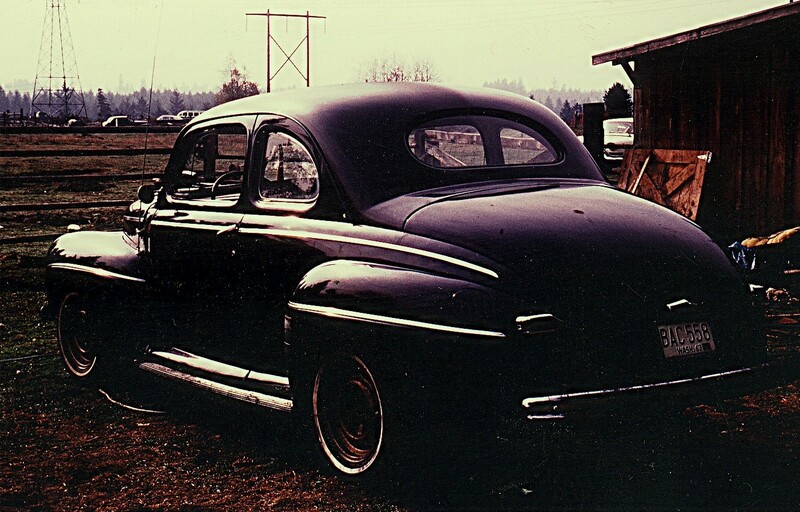 The first happened before I bought her and netted her a 1947 Ford right rear quarter panel. Then there were two left turners and I rolled her over in the snow once. When I rolled her the right side of the roof was pushed left about 6". This is a shot of the undamaged side, but if you look closely at the top, you can still see the overspray from my repaint job which wasn't rubbed out yet. The tail lights are 1941 Mercury and fit the holes in the 1947 Ford rear fenders perfectly. (Well, I did use a little lead.) Remember, Bondo had just been invented and was only used by those young, upstart cheaters... It took me a number of years to follow suit. Late one evening in March of 2004 the good old Ford tractor helped her out of her cozy "SeaLand" container home of the last 12 years. The good old (newer) Ford 4WD, (beginning to see a pattern here?) and some strong backs then helped her into the shop for some serious fixen. Emmy Lou and I have logged over 250,000 miles together and used up 9 engines; 7 flatheads (beat up and wiped out drag racing) and 2 Oldsmobiles. The first one, a 303, I pulled out of an iron pile in pieces, sanded the rust off the crank journals and cylinders with emery paper and threw together. It lasted 3 years and would have gone farther if I hadn't run it out of oil at the top of White Pass (WA) with the nearest service station 20 miles down the hill. The last one, a 324, I properly rebuilt in 1963 and it is still running, with a fresh rebuild and now in a 1950 Oldsmobile, but it only had 158,000 on it when I sold it. In keeping with my philosophy of "if you want Chev (and there's nothing wrong with that) buy Chev." But if you drive a Ford, it should be a Ford. All the way. So this rebuild is being done only with Ford parts, parts made for Ford, or by me. I do all my work; from rebuilding the engine to applying the finish coating. Although I've gone to a Ford 9" rear end, AOD transmission and 302 V8, power disc front brakes and power steering for safety and modern driving, you'll notice that I've retained the original front suspension. After putting over 250,000 miles on it I can guarantee that "bump steering" (unless you're professionally road racing) is a figment of the imagination of those who want to sell you new parts out of or copied after a Mustang II or something similar. Besides, driving an old car, the way it went down the road back then, is just part of of the fun. To see pictures of the rebuild click on the thumbnail below.